So, I got an allotment. What, I didn’t tell you? OK, well the thing about allotments is that they are a lot of work, and you get your hands mucky, neither of which is very conducive to writing blog posts. But in any event, here it is, in all its recently manured glory. Now, I learned a few things about the biochemistry of plants when I was at University – sadly I can’t remember much of it now. But that’s OK, because undergraduate plant science is nigh on useless for any practical applications (ie actually growing stuff). What you quickly learn is that for allotment gardening, since you are trying to grow quite a lot on a fairly small plot, soil fertility is really important. 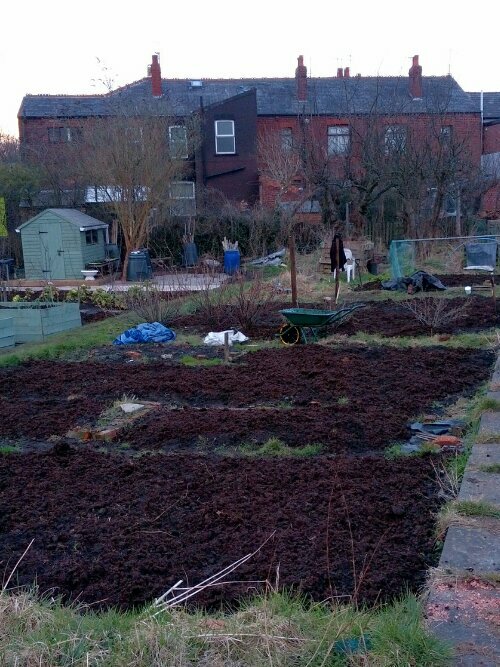 What’s amusing about putting manure on an allotment is that you’re basically mixing large quantities of old horse faecal matter into the soil in which you’ll (hopefully) grow lots of food. On the face of it that sounds like an odd thing to do, but considering that everything that is harvested from an allotment reduces the nutrient content of the soil, it needs to be replenished. As an added benefit, the vegetable matter (aka digested grass, and the sawdust the stables used, both well rotted) helps the soil to retain moisture, and provide food for worms. The worms aerate the soil (by eating it, basically) and improve its crumb structure. What does need to be remembered is that the same processes that incorporate organic matter into the soil in an allotment are the same processes that have been recycling organic matter for billions of years on earth. So putting manure on an allotment is just making use of a lot of conveniently evolved soil bacteria and invertebrates to help you grow bigger potatoes. So having convinced myself on a scientific level that I wanted to mix horse poo into the growing medium for my food, I set about moving it, with a wheelbarrow, and a shovel. When you move a wheelbarrow worth of manure, it seems like a lot, right up to the point that you dump it on one of the beds. At this point it appears to dramatically reduce in volume, and you realise that “10 or so barrow loads” just isn’t going to cut it. So about 25 barrow loads later, I appeared to have a very serious mole infestation! Another 15 minutes and it’s all spread out over the beds, under the fruit bushes, and around the newly planted raspberries. Oh, and my hands, arms and back are telling me that I really need to stop now. So what next? Soon we get to start planting things – potatoes, onions and shallots and garlic directly into the beds, and everything else from seed at home. Until next time….